of Building 10, Level 3, 658 Church Street, Richmond VIC 3121. Promotion, see Annexure-A for relevant timings. Game Period The Game will open at 09.00am AEST on 13/09/2018 and close at 11.59pm AEDT on 29/10/2018. the consent of your parent or legal guardian before entering this Promotion. Participating Outlets and agencies associated with this Promotion are ineligible to enter this Promotion. niece, nephew, brother, sister, step-brother, step-sister or 1st cousin. Eligible Products that result in Eligible Entries (as detailed below). 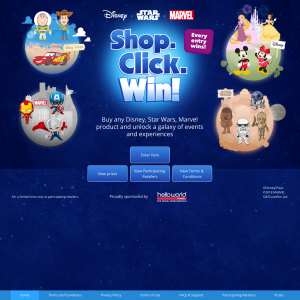 Eligible Products Any Disney, Disney Pixar, Marvel or Star Wars licensed products. will each (where applicable or referenced) be considered a “Franchise”. forfeited and no substitute prize or compensation will be offered. Total value of all instant prizes available to be won in the promotion is up to: $437,412.00. taking such prizes (unless expressly stated). supplier, including (where relevant), periods of validity, restrictions and limitations of use. via email (as the case may be). To avoid doubt, Tokyo and Shanghai destinations are expressly excluded. (b) Only one (1) entry will be permitted per Eligible Product. via email about the Promotion. 5. that payment for the Qualifying Purchase has been received in full. it will render the entry invalid. Entrants must allow two (2) business days for Validation to be completed. and when requested by the Promoter. and compliance with these Terms and Conditions. submitted by the entrant will be deemed invalid. It is sole the responsibility of the entrant to provide the required information. & Reserve Entries Focus, Level 1, 500 Chapel St, South Yarra, VIC 3141 (“Draw Location”). these Terms and Conditions (“Reserve Entries”). Major Prize Draw selected by the Eligible Entrant on the online entry form. booking class with airlines or specific room category availability with accommodation provider. or accommodation at other destinations. Once a Major Prize is booked, no changes can be made. conditions of use and expiry, if relevant. establishment, to cover any incidental hotel charges. incurred by those travelling (unless otherwise stated in these Terms and Conditions). the Australian Government’s travel advisory and consular assistance advice available at www. those involved in providing other goods or services included in a Major Prize (“Third Party Terms”). in to any country; or (c) suffers any other loss, injury, or damage. personal property that may be lost or damaged during participation in the Major Prize. directions from the lottery authorities. Major Prize winners are advised that tax implications may arise as a result of accepting their prize. already included as part of prize value). and no alternative prize or prize component will be offered. Major Prize Winners Promotion Site from 29/11/2018. 08/11/2018 at the Draw Location from all non-winning Eligible Entries remaining in the Promotion. Chance Draw will be forfeited at the discretion of the Promoter. state and/or territory gaming departments (“Re-Draw/s”). be advertised on the Promotion Site from 01/03/2019. Entry Limits A limit of one (1) entry may be submitted per Eligible Product purchased in a Qualifying Purchase. Permit Numbers NSW LTPS/18/25601, SA T18/1070 & ACT TP 18/01164. 1. Details above and the following clauses collectively form the terms and conditions of this Promotion (“Terms and Conditions”). 2. Each entrant is responsible for ensuring his or her familiarity with these Terms and Conditions at the time of participation. every person who participates. No correspondence will be entered into. 4. Any values stated in these Terms and Conditions are in AUD/RRP/including GST. persons the winning entrant is. 6. If a winner is under 18 years of age, their prize may be awarded to their parent/guardian on the winner’s behalf. names, addresses and/or email addresses) will be disqualified. Promoter may be required by the Promoter if this occurs. details, or for providing invalid information. 10. Entries are deemed to be received at the time of receipt into the Promoter’s database, not time of transmission by the entrant. 12. The Promoter is not responsible for any undelivered emails due to an entrant’s spam filters or email settings.